Veru Inc. is an oncology and urology biopharmaceutical company developing novel medicines for the prostate cancer continuum of care and urology specialty pharmaceuticals. The Veru prostate cancer pipeline includes zuclomiphene citrate (also known as VERU-944, cis-clomiphene) and VERU-111 (antitubulin inhibitor). Zuclomiphene citrate is an estrogen receptor agonist being evaluated in a Phase 2 trial to treat hot flashes, a common side effect caused by hormone treatment for men with advanced prostate cancer. VERU-111 is an oral, next-generation, first-in-class selective small molecule that targets and disrupts alpha and beta subunits of microtubules in cells to treat metastatic prostate cancer patients whose disease is resistant to both castration and novel androgen blocking agent (abiraterone or enzalutamide) therapies. VERU-111 is being evaluated in men with metastatic refractory prostate cancer in an open label phase 1b/2 clinical trial. 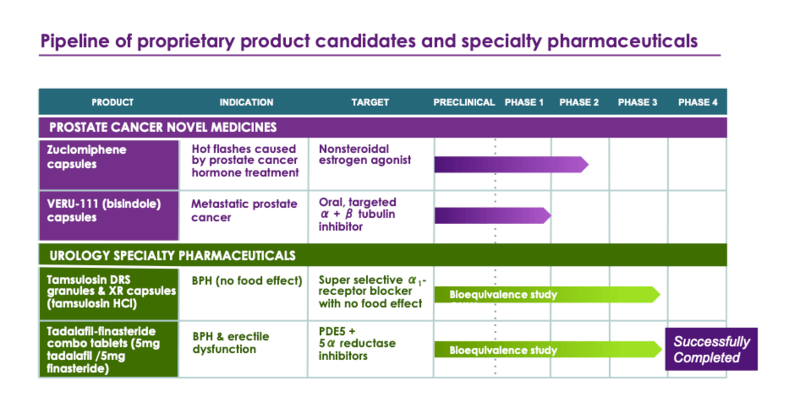 Veru is also advancing new drug formulations in its specialty pharmaceutical pipeline addressing unmet medical needs in urology. The clinical trial of the Company’s proprietary Tadalafil and Finasteride Combination tablet (TADFIN™) met FDA requirements for bioavailability and bioequivalence for the co-administration of tadalafil 5mg and finasteride 5mg dosed daily for benign prostatic hyperplasia (BPH). Tadalafil (CIALIS®) is currently approved for treatment of BPH and erectile dysfunction and finasteride (PROSCAR® and PROPECIA®) is currently approved for treatment BPH and male pattern hair loss. The co-administration of tadalafil and finasteride has been shown to be more effective for the treatment of BPH than finasteride alone. * The Company anticipates submitting an NDA for its TADFIN™ tablet under the 505(b)(2) regulatory pathway in the second half of calendar year 2019. Veru is also developing Tamsulosin DRS granules and Tamsulosin XR capsules which are formulations of tamsulosin, the active ingredient in FLOMAX®, which Veru has designed to avoid the “food effect” inherent in currently marketed formulations of the drug, allowing for potentially safer administration and improved patient compliance. Estrogen receptor agonist for the treatment of hot flashes caused by prostate cancer hormonal therapies in men with advanced prostate cancer. A novel oral selective antitubulin that targets alpha and beta tubulin for metastatic prostate cancer as well as for other forms of advanced cancers. A new slow release granule formulation of tamsulosin (FLOMAX®) used for the treatment of BPH, also known as enlargement of the prostate.